Most of us have a old smart phone with camera lying around because we have upgraded to a sleek new phone. And most of have kids or old people at home whom we wish to continuously or randomly monitor for their safety and well being. Well with the help of this tutorial you can convert your old smart phone into a security camera and view the real time feed from your house/or any other place you did wish to monitor. But remember you have to have 3G or Wi-Fi enabled on the phone. Monitoring through Skype : The first method is simple enough and can be done outright. Just remove your old phone from the dusty environs it has been condemned to and sign on in to Skype with a brand new user name and password. However, the Skype option will only work on a phone that has a front facing camera. Hence, Skype on an older device can be only used for audio monitoring if there is no front facing camera. 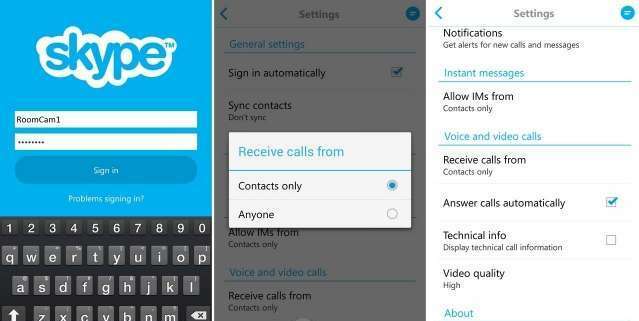 Now head over to the contacts in the old phone, add the Skype account to your contacts list and accept the same on the camera device too. Once done, you can keep the camera device on standby. add just the phone number from which you will be viewing the video feed on(obviously your current one). Now keep the old smart phone positioned in a place that has a nice vantage view. That done, in future whenever you want to check out the goingons in your residence just place a video call to the number. The smart phone you have set up will automatically answer the call and start streaming the audio and video to you. To make the camera device operate in stealth mode, turn off all notification LEDs, sounds and alarms, reduce the brightness levels and time out of the display to the minimum and cover the display with a black card or paper to hide the display’s light. This method will ensure that the camera device will only be streaming the video when needed without anyone knowing it is there and also saving the battery juice. Using this method you can also monitor from a PC camera in your office. 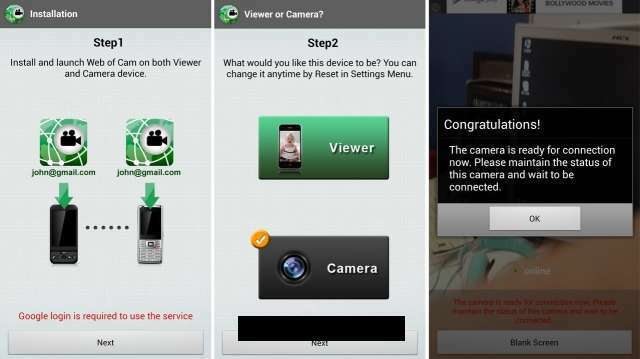 WEB of CAM method For this method you have to download and install the app ‘Free Internet Cam (Web of Cam)’ from here. The App is available for Android, IOS and Symbian devices. Once you have downloaded the App, you have to set it up. The first time you launch the app, you will be asked to enter your Google account details for this app works with only your Google account. Once you have put in your Google credentials, proceed to the next screen. Here you decide what you want the Android device to act as with two options > a camera or a viewer. For the old smart phone you wish to place in your residence select Camera here and tap on the 'Next'. Once done, the app will start up the rear camera on the display and wait for a viewer device or client to connect. You have a choice here to keep the phone’s display kept on, blank out the screen by tapping the button on the bottom or simply put the device on standby mode. The app will operate in the background and keep streaming the video feed. Now place this 'Camera' smart phone in a vantage position to get a perfect view. Remember to connect a charger to the phone because this feed is 24x7 and your old smartphone battery may dry up. Also remember to select 3G from the connection settings and do check whether the 3G signals are being received in the corner you want to place the 'Camera' This done now your camera ready for action. Once you have logged in, your camera will show up in the list of ‘Available cameras’. Tap the relevant camera to get the video feed. Now that the feed is available via the Internet, you can monitor the room from anywhere. 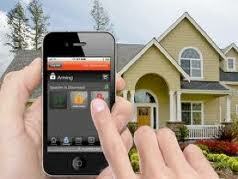 Keep a watch on your home, office, garage or pretty much anything you want to monitor. Additionally you can also remotely control a few elements of the camera like taking snapshots, switching between rear or front camera, turning LED flash on or turning it off. This app works on iOS and Android devices in both ways, as a camera and a viewer but on the Symbian devices you can use it for Camera function only. Both the methods are equally good but your selection depends on the quantum of monitoring you want to do. For me personally, the Web of Cam worked super.